We have had wonderful weather which we have been making the most of! We have spent many hours sat out in the garden enjoying the beautiful sunshine. We have played ball games, skittles, tennis and badminton outside. Staff have been taking residents daily for walks to the duck pond to feed the ducks and rapidly growing ducklings. 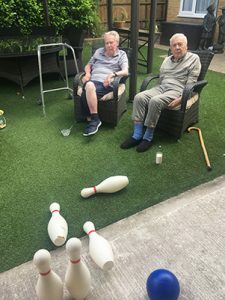 Some residents have even been having their meals outdoors. We have been going to the ‘Teas on the Rec’ on Thursday afternoons and are lucky to have tables reserved for us. This event seems to get busier each year. We look forward to the delicious cakes and people- watching. There is no Community Café for the summer whilst the Teas on the rec are occurring. 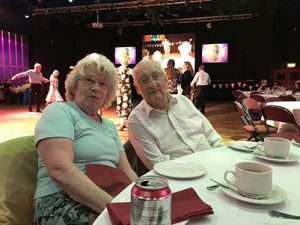 We went to the Summer Tea Dance at HG Wells. Jan, Vera and Colin all got up to dance and everyone who was there had a very enjoyable afternoon. 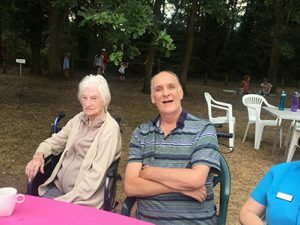 We were kindly invited to the Parish Garden Party at the Vicar’s house. Unfortunately, due to the distance and uneven surfaces only residents who could walk without assistive aids could attend. However, those who did go had a fun afternoon although the weather was a little tempremental. 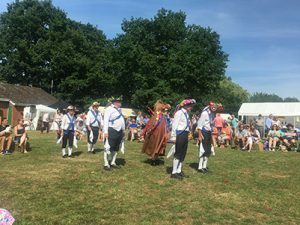 The weather for the Strawberry Fayre was perfect. 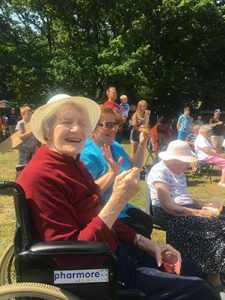 A large group of residents went across of the Strawberry Fayre. 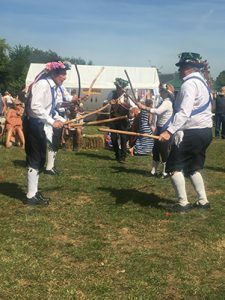 We looked around the many stalls and had front row view for Chobham Morris Dancers. Everyone had strawberries and cream and cold drinks to keep hydrated. It was a great afternoon and everybody who went to the Fayre had a lovely time. We have had our usual performance from Tina from High Kicks and Heels. Her show was as entertaining as ever and she had everyone singing along to her golden oldies. Bailey our visiting PAT dog continues to come to Elmfield on alternate Friday’s. Everyone loves to see him and he enjoys all the attention. The ladies from Bisley Church came for their monthly service. There were not many people present but it was an intimate service. We have continued with our pub lunches every fortnight which continue to be popular. As always, we receive a warm welcome and our usual seats were reserved for us. 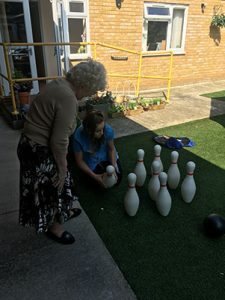 Other activities have been coloring felt pictures, quizzes, chair- based exercises, using the power plate, pamper afternoons, bingo, board games, memory games and cake decorating. We have the Chiropodist at Elmfield on Tuesday 3rd July to attend to our resident’s podiatory needs. On 18th July we have a choir at Elmfield to sing for our residents. This will be their first time with us but we are looking forward to welcoming them. As requested a BBQ has been purchased for Elmfield and we are looking forward to having some grilled BBQ suppers. This was requested by Roger who enjoys a BBQ and often goes to his brother’s house for one. A BBQ for friends and families of Elmfield will be organised shortly so please keep a lookout for invites and poster with details. This was requested by Roger who enjoys a BBQ and often goes to his brother’s house for one. Niccii is currently in talks to get some WW2 vehicles to Elmfield for everyone to look at. These will no doubt bring back memories for some residents. Details to be confirmed. There will be a residents and relatives meeting held at the home on Friday 13th July at 3pm. All are welcome and refreshments will be provided. We welcome two new staff members who will be starting shortly when their security checks and references are completed. Pamela Monge Coto will be joining the day care team next month. She is highly skilled and experienced in health and social care. Samantha Woodhead will be re-joining us to cover Sunday shifts next month. Sam worked here for several years and pursued a career in childcare but wishes to return to us for weekend shifts. We also welcome Becky Rowe to our bank staff team to cover sickness, holiday and vacant shifts. 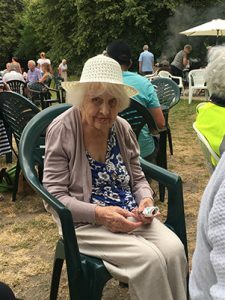 We are devastated to announce that Nora Cotes sadly passed away at the home on 20/06/18. After 5 years at Elmfield it isn’t the same without her. We have a new resident called Jill Cooley who joined us at the end of June. She is a lovely, sociable lady and is getting used to life at Elmfield. 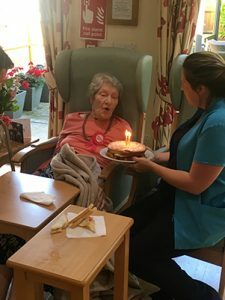 Freda celebrated her 93rd birthday on 12th June, her family attended a birthday tea party with all her friends at Elmfield. Jo King celebrated her birthday on 27th June. 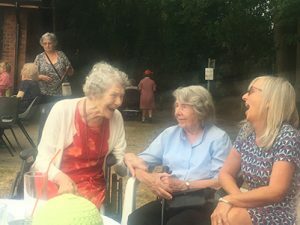 She received beautiful flowers and chocolates from her daughter in Canada and enjoyed a tea party in the garden at Elmfield. GDPR (General Data Protection Regulations) have recently changed and relatives have been given consent forms to sign allowing us access to personal information about the residents which of course we need to ensure that we can correctly care for our residents. The type of information we hold about residents was highlighted as were details how we keep sensitive data safe and secure. There is a Data Privacy Notice on our website as well as a Data protection statement for residents and employees. This month Niccii completed training to become a ‘Dementia champion’. The Alzheimer’s Society started a project in recent years to raise awareness in communities about dementia. 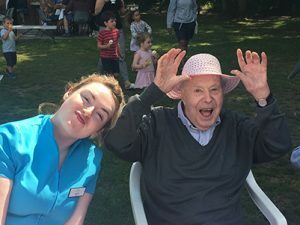 The aim was to create ‘Dementia friends.’ To do this, dementia champions run one- hour information sessions in the community to raise awareness of dementia and each dementia friend must undertake an action in the community to help someone with dementia. Niccii is aiming to encourage staff, visitors and people in the local community to become dementia friends. Some of these sessions will be held within Elmfield after Niccii’s working hours. It would be great if people would show support for this. This month we had our annual Health and Safety Inspection conducted by Citation. There were a few minor prompts but overall it was very positive. Well done to everyone! All recommendations have been fulfilled since then. Employee of the month for June is awarded to Dannii Heal for completing lots of training alongside working three or four nights a week, as well as doing university work and babysitting for a friend. Dannii has a kind and caring nature and is an asset to the team at Elmfield. We will miss her when she goes back to university in September.